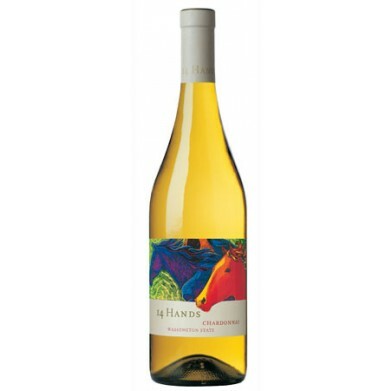 14 HANDS CHARDONNAY for only $11.98 in online liquor store. 14 Hands Chardonnay is a fresh, lively Chardonnay from Washington State. The inspiration for 14 Hands wines recalls a time when wild mustangs once freely roamed the hills of eastern Washington State. These small horses, measuring a scant 14 hands high - a “hand” being equivalent to a man’s palm width and how horses were measured then - would travel down from the hills every day to drink from the mighty Columbia River. Fruit for this Chardonnay was sourced throughout Washington state, including the Horse Heaven Hills, Yakima Valley and other parts of the Columbia Valley. 22% of the wine was oak fermented, predominantly in neutral barrels.